In January 2011, the New York state Board of Regents adopted the Common Core State Standards (CCSS) for English language arts and literacy as well as for mathematics as new learning standards for all students in New York state. The new standards were implemented in schools throughout the state at the beginning of the 2012-2013 school year. By having common standards, all students across the state — and across the country — should have the opportunity to learn the same skills. In the past, every state had its own set of academic standards, meaning U.S. students were learning different skills and concepts at different rates. The Common Core Standards give all students an equal opportunity to learn at higher levels. In turn, pupils should graduate with a greater chance to succeed in college, careers and life. Forty-six states brought together experts, teachers and researchers to write the Common Core State Standards, along with nearly 10,000 comments and suggestions, including many from New York teachers and parents. Please visit http://corestandards.org/the-standards to read the full set of standards. Why have the Common Core Learning Standards been introduced? These skills were tested for the first time in 2012-13 by New York’s grades 3-8 ELA and math exams, which marked a time of transition in our schools. How did the changes affect student performance on state exams? State officials warned parents, school leaders, teachers and media outlets to expect a dip in student scores on these exams. And, indeed, scores were lower. As expected, the massive changes in curriculum, testing and scoring practices resulted in a significant decrease across the state in student proficiency levels compared to prior years, including in Marcellus Central School District. Read more about 2012-13 scores. 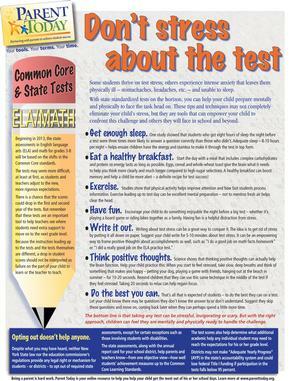 Click here to view sample questions from the 2013 NYS tests. It’s important to remember that it will take time for schools to become accustomed to higher standards, and the test scores reflected this period of transition. In the end, students will ultimately benefit not only by learning more, but also by developing better problem-solving, critical thinking and communications skills. What else is important to understand about the roll-out of Common Core Learning Standards and New York’s new tests? It’s normal for students to feel a certain level of anxiety around any exams — we just don't want them to become overwhelmed by this anxiety. As parents, do what you’ve always done — encourage your children to stay calm, take their time, review their work carefully and do their best. Just as with anything students do in school, these exams are important and we want students to take pride in their performance. In terms of the scores, we cannot compare the 2012-13 exams to the 2011-12 exams. Because the instruction leading up to the tests and the tests themselves were different, any dip in student scores should not be interpreted as a decline in student learning or teacher performance. Marcellus remains committed to communicating with parents on the implementation of the new learning standards and the new exams, as well as what the student test scores mean. We will continue to work diligently to teach the skills that are measured by these exams through thoughtful and engaging lessons and activities — not merely test preparation activities. Over time, the new standards will strengthen our instructional programs and this year’s tests will serve as a baseline of student performance for the district to build on in future years. How can I get more information about the Common Core Learning Standards? Feel free to contact your child’s teacher or principal if you have questions about the state exams or the new standards. In addition, please visit http://engageny.org/parent-and-family-resources for a variety of materials relating to the Common Core Learning Standards.